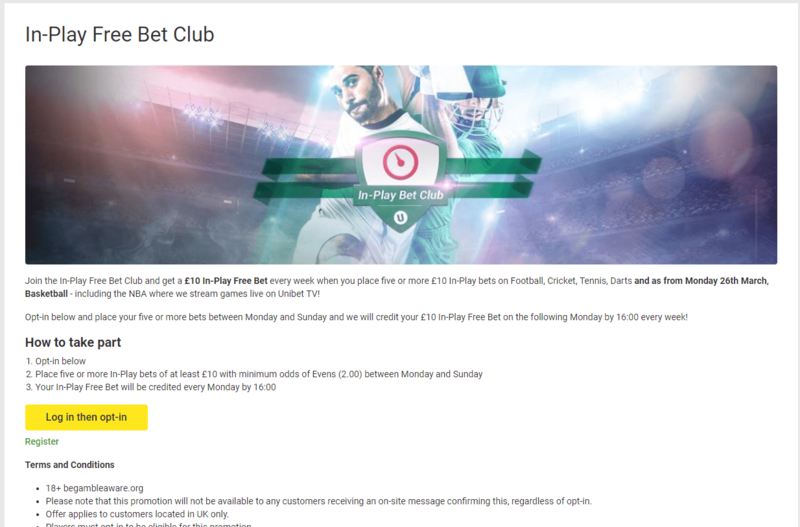 Unibet have a promotion that runs every week from Monday to Sunday whereby you bet 5 x £10 inplay bets and receive a £10 inplay free bet. This offer is very quick and easy to do, and it should definitely be part of your weekly matched betting routine. All markets on Football, Cricket, Tennis, Darts and Basketball only. Inplay bets only. Opt In required. Occasionally Unibet will run a promotion that you can combine this with alongside. If not, just find close matches and place your 5 bets. To trigger the £10 inplay free bet you need to place 5 x £10 inplay bets at odds of 2.0+. 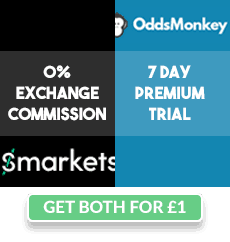 Finding a match for this offer is slightly different than others because the bets have to be inplay and so won't appear on Oddsmonkey's Oddsmatcher. The easiest way to do this is to stick with either Football or Tennis. For Football, you want to wait until half time. When it's half time in a game, compare the back and lay odds of any market on that particular game. The reason you wait for half time is so that no goals can be scored which would make the odds go crazy. For Tennis, you want to wait until every odd number of games in the set. So 1-0, 2-1, 3-2, 4-3, 5-2, or the end of a set. This is because the tennis players will have a 1 minute break so the odds won't change for that time. If you're choosing this method it's best to stick to a tennis match that is being streamed live on bet365 so you can watch and see when they're about to start playing again. Whichever sport you choose, you simply need to find a close match between the back and lay odds as normal. If you're confident you could attempt basketball when there's a timeout or cricket when there's a delay (perhaps after a wicket has been taken). Bet £10 inplay on Unibet on the market of your choice and lay it off at the exchange. Make sure your back bet has been accepted before placing your lay bet. Bookies can sometimes change inplay odds as your bet is being placed. You will receive your £10 inplay free bet by 4pm on the Monday. I suggest betting on a team at half time with high odds (4.0+) to convert it into £3-£4 profit. This offer can be repeated weekly. The free bet has to be used inplay, so use the same strategy when finding a match. Make sure both your back and lay bets have been matched - odds can move quickly inplay. If doing this offer without combining; try to lose no more than £1 per £10 bet. If combining you can take a bigger loss but it's always good to keep it as low as possible for more profit!